Very rarely will you hear a person identify as Malaysian only--most identify as Malay, Indian, or Chinese. Those of mixed ethnicity have various names for themselves--Aunty Letchimi's daughters call themselves Chindian. It's not uncommon to hear ethnicity identified when someone is being described, either. It's always "the Indian aunty who sells drinks at market" or "the Chinese uncle who sells chicken." 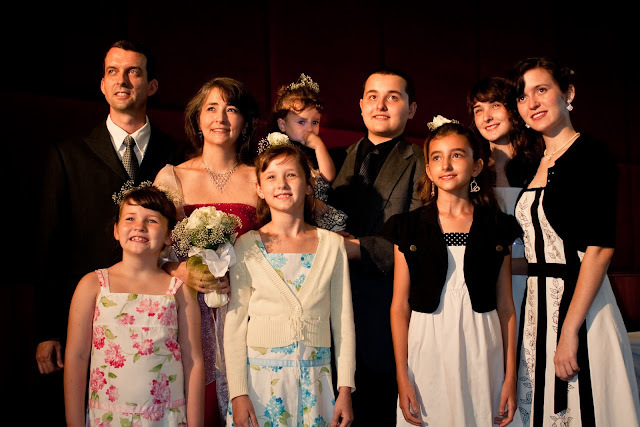 An eerily solemn family photo from my parents' vow renewal ceremony, about 6 years ago. My family, with some of us being fair-skinned and blue eyed, and others of us tanned and dark-eyed, have sometimes bewildered those who attempt to describe us either via ethnicity or nationality. I remember my family being told, "You must not be Americans--you are too skinny!" But we don't look Dutch or German either, though most of us are tall, we're not quite that tall. My mom in particular has been found to be a conundrum. I distinctly remember that once I was attending a drama club meeting when the school's security guard walked in the room and said, "There's a Eurasian mom at the gate asking for her daughter." I looked around at my fellow drama club attendees, and realized, "Oh, that must be my mom!" It was. Just weeks ago, someone who had just met mom told her, "I can tell you're Eurasian. You know how I know? It's the accent." It's true that after 11 years abroad, she's lost a lot of the tell-tale American accent. Angel is a new mystery for the community around us. He blends in better than I do, but many people guess that he's not a local. In the elevator a few weeks ago, an aunty asked him, out of the blue, "Are you Malaysian?" When he replied, "No," she said, "Oh, Pakistani." He clarified that he was American. Some years ago, one guy asked him if he came from Oman. He's most commonly identified as coming from somewhere towards the Middle East. Angel made his own wrong guess the other day, when he asked a guy standing in line behind him at the post office what a sign in Bahasa said. The guy said, "I don't know!" Angel was surprised, because he'd assumed the guy was Malaysian. So, he asked him where he was from, the guy said, "Chile"...and I'm sure you can guess, from that point on, the conversation continued in Spanish. So, he made a new friend. In this part of the world, you get used to being asked about your heritage and where you came from. When you look obviously different from everyone else, it makes people curious. Some in my family blend in better than others, but those blue-eyed little girls, they have certainly had their day in the spotlight, with strangers frequently asking for pictures with them. In September, I was out with my sisters and mom when a family asked if they could take a picture with Sarah. After Mom said it was okay, they added, "Well, how about with the whole family?" We all huddled into one spot for a photo. Living here so long, you come to take the questions and the requests for pictures as signs of care and love. This isn't America, where we're pretty much content to not know anything about anybody we pass by. This is Malaysia, and if we see anyone who looks interesting, we'll stop and stare, and then we'll go over to have a chat and say hi and ask them all sorts of personal questions. The conversations make life fun, and make you feel as if it's possible to turn strangers on the street into friends within your community. When I was in Ukraine, people knew I wasn't from there. Kind of fun to stand out. When I was little people would ask me where my family was from and I was always hesitant because I wasn't sure. Plus half of us are darker and half of us have fair skin. It is interesting for me to learn about cultures in foreign countries. Jennifer, I agree. While this post is very interesting there is a sad element to me too because of how things "ought to be" here in the States. As I read your post I was reminded of a friend who asks the best questions... not too personal, but with intent on getting to know you better and I realized that she travels all over. Maybe that is a skill that she has picked up abroad! Great post! Love learning about this. For my school cohort, there is a service trip to Malaysia every two years and I'm considering going next year. I love learning about this - it must be so fun to be exposed to so many different cultures! What a fascinating family and story you have, keep sharing them with us girl! I feel like almost any other culture is super open to asking questions but America's culture. Do you get that feel? We get asked things all the time? I'm actually surprised at questions they ask but again that is just how it is in thie part of the world. I loved reading this— it's very interesting to me how different cultures are and how they embrace the diversity. Oh how I wish we were more open about this stuff in America. I hate holding back questions for the fear of offending someone. It's sad that we have to live that way. I am catching up on my #write31days reading. I am fascinated by your topic and will keep reading and catching up. What a really cool experience to live abroad. I also appreciate how unique and specific your 31 days topic is/was. It's refreshing.